Like the government, we're deeply concerned about the number of unemployed people sitting around at home all day doing nothing. 1. in their own homes. 2. They have official-looking uniforms.  Reduces the number of unemployed.  They no longer sit around all day doing nothing.  security of the premises.  Increases self-respect (from wearing nice uniform).  recommend employment as Home Administrators.  To be funded by the government (ie public funding). Why should the government fund it? Well, the government already spends billions of pounds of public money funding job creation  eg schemes such as the New Deal, Regional Selective Assistance Grants, etc. Why not go a small step further to fight the evil of unemployment? And, anyway, would you prefer public funding of idleness? Surely it's better to fund respectable jobs. Q: Won't these jobs be totally pointless? A: Tell that to the security guards working at your local grocery. Q: But there's no market demand for such jobs? A: Don't you want to see this country have lower unemployment than France? Q: But why security guards? A: The security sector is growing. Even small village shops now employ security guards. Q: Why's that? Has the risk of crime increased? Q: Won't it cost too much? A: It's a small cost for showing the success of... er... market reforms in reducing unemployment. Q: Shouldn't jobs be provided by the market? A: Who cares as long as the press report falling unemployment. 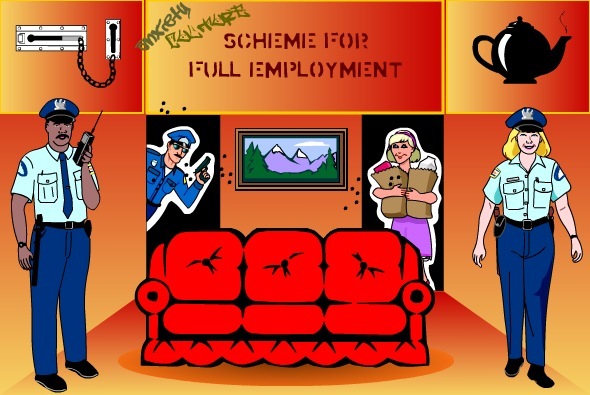 Send a plain text copy of the Scheme for Full Employment to your Member of Parliament.